Welcome to Mocktropica – an adventure of Poptropica’s management mishaps and fourth wall breaking! Once you arrive on the island, go inside Poptropica Worldwide Headquarters. Inside, head left and talk to the guy with the glasses. He’s the focus tester who asks kids what they want so he can make them happy and therefore make money. Talk to him and he’ll give you a piece of Cake. After visiting all the floors, leave the building and come back in. The girl from earlier tells you that everyone is in the basement, and unlocks the door for you. Once inside, talk to everyone, then talk to the girl second to the left, and ask if you can help. She’ll send you on what’s totally a fetch quest. She wants you to find some of the employees and will give you their (three!) ID Badges. Go to the computer to the right of her and move the buildings around in the island editor (doesn’t matter where). Leave the basement, and once you’re upstairs, you’ll see the focus tester again, who will now tell you about this “achievements” feature he’s implementing. Now, leave the building and head right towards Ephraim University. You’ll probably earn some useless achievements along the way. Once you reach the university, go inside. You’ll see one of the employees that you’re supposed to bring back to Poptropica HQ. He’s the professor and writer, Max McPatrick, and he wants a soda (that will come later in this walkthrough). Now, go back to the Poptropica HQ basement and click on the second computer to the left. Click to change the mood from “grumpy” to “happy”. After that, leave the building, and head right to the cheese factory. Because you changed the mood, the guard will let you into the building. Once you go inside, hop up to the second floor. 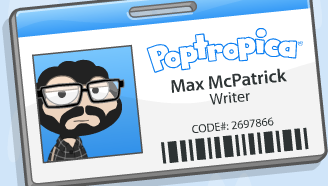 One of the people you need to bring back to Poptropica HQ is there – Lance Pitcher, the designer. The boy will run back to Main Street, so follow him, and he will run to the cliff (Mt. Funshine). Follow him there. Your cheese curds will fall down the rockface and the Narfs will come up, forming a bridge you can cross. Once you cross, climb the mountain, and grab the Pickaxe. After you get the pickaxe, go back to the Poptropica HQ basement and change the settings to “night”. Go back out and you’ll find a shady guy. He gives you coins not go to the cheese factory, but the guy stops you. Pay him with a coin. Go inside the factory and use your pickaxe next to the guy. It will ruin the machine, and now you’ll have Lance Pitcher back at Poptropica Worldwide Headquarters. While you’re in there, click the settings back to “day” and “clear”. He’s the developer, Billy Jordan, and he says he will go back if you beat him at Mancala (just in likeNabooti Island!). Basically, the goal is to get the most stones into your big tray, which is on the right (the opponent’s tray is the other big one). In each turn, you select a cup, and the stones inside of it will be dropped into the cups after it (one at a time) until all the stones from that cup have moved. If the last stone lands in your tray, you get to go again. If the last stone lands on an empty cup, you get to capture all the stones across from that cup into your tray. Once you get the soda, hop down to the right and there’s a crate you’ll need to break open. Go back into the basement and click on the island editor where you move the buildings. The crate is in the location – click on it and it will break. Now, leave the basement and go to the University and give the professor his soda. He’ll tell you that when he sees a Poptropica script, he throws it away. Now, go back to the HQ and go into the basement again. You’ll see two bags in the corner moving. Use your cake now and the guy there will move. Leave and go back to the university. Click on the professor and give him the script. Leave the building, and an annoying ad will pop up. Go to back to HQ, up to the third floor to ad sales and pay the lady to get rid of the ads for you. Now go to the top and talk to the budget lady, who says she eliminated most of the servers so Poptropica would run slow. Go inside the basement and put on the protection hat, then bust all of the letters with it. After you bust all the letters, you will be in Poptropica’s internal servers. Once you get inside, run to the red cord and make it go down. Then click the blue one once, and then click the green one twice, and the server is all fixed. When you get outside, you’ll find out that the business associates were behind it all and were trying to ruin Poptropica – and then they’ll summon the real life Mega Fighting Bots! Now it’s time for the final boss battle. To defeat the robot, just shoot him with coins, and avoid the things he throws at you. 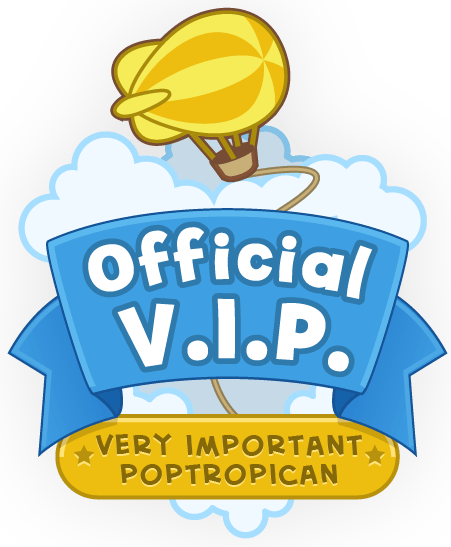 Once you’re done, you’ll be awarded the Mocktropica Island Medallion! Congratulations! I beat the robot boss but after the focus test guy says You haven’t seen the last of us we’ll make a new game it wont do ANYTHING and the cursor is loading thing so I can’t move. Are you clicking the robot to throw coins at it? Afterwards you need to click the achievements, too. 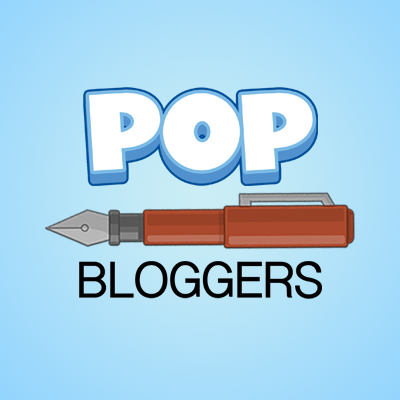 Hi, Poptroica tips for poptropicans!!! Do you know how many islands there are? Including episodes! Hi Haley! I’m going to say there are 51, but there may be 52 😉 This is including the episodes. Any other authors can correct me. Sadly we can’t put your username up here, but would you like me to put your username on the Fantastic Friends page? Just added it! I’m sorry I’m really late, but I got out of school yesterday, so I should be much more active! Aww, we’re sorry! You can still follow our guide until you get back to the hat to make it much quicker. It’s my favourite, as well. Aw, I’m sorry you’re having trouble. ): It is my favorite island but very luckily I didn’t encounter any glitches when playing. Hope you have luck with it in the future! What’s wrong with the crate? Anybody like spy? The easiest island ever! um I think you needed to put a bit more detail . But thanks anyways. I’ll be finished with mine in a few days or a week, can I put it up here then? …Which is on the PHB. (; Sure! Actually, the one in the PHB, was updated with Brave Tomato`s… so they’re mixed. I think MP means the sign you use the hat to knock down…. same thing happened to me!!!!!!!!!!!!! !